Apple season is already starting here in Georgia! I can’t believe it is that time again. 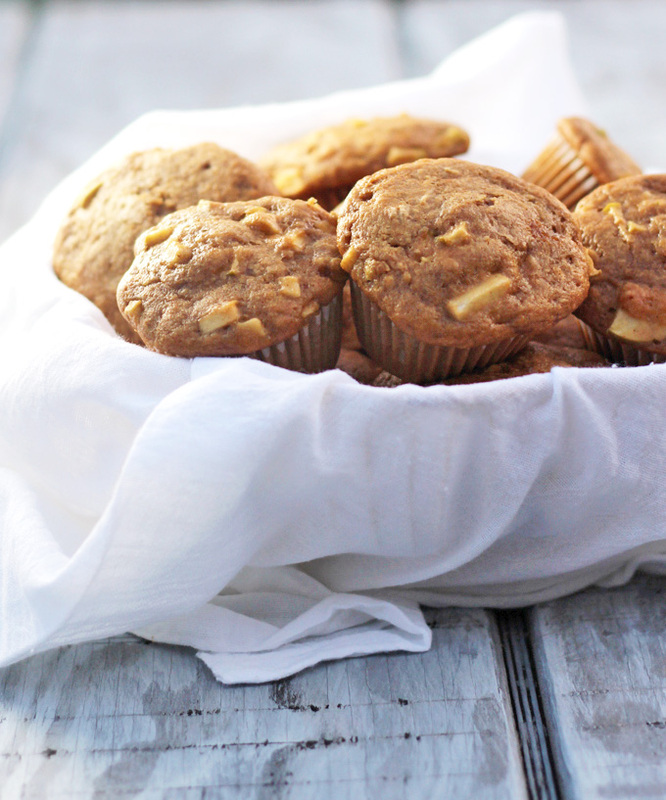 I love to go pick my own, but the apples in these muffins came from the grocery store. Wish I had a better story. If I make it to go pick, I will make another recipe with a picking story. But, for now I just wanted something baked that wasn’t too sweet. 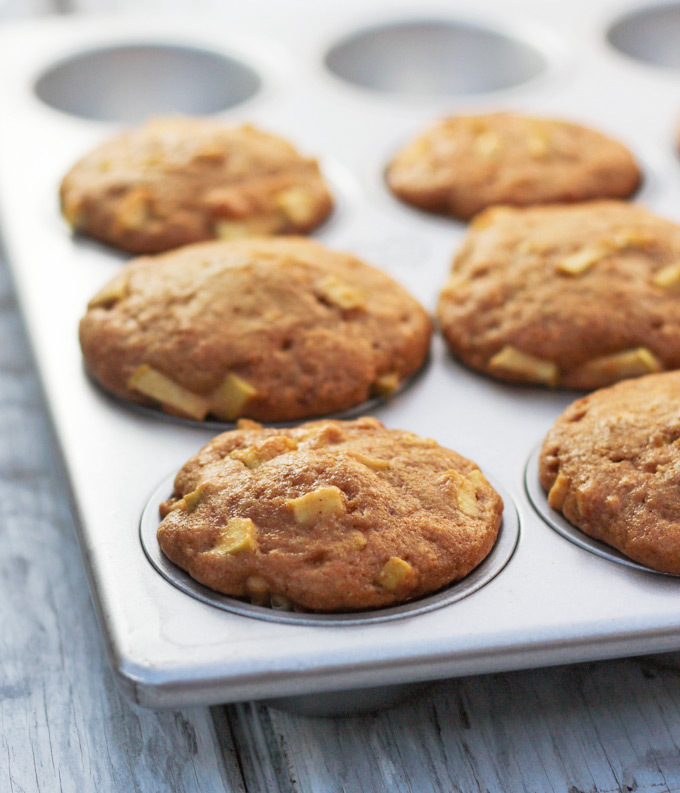 I am calling these apple muffins healthier because a little over half the flour is whole white wheat, they use olive oil, and the sweetener is cut a bit from my usual and is a combination of coconut sugar and honey. The result was a super moist, not too sweet, delicious muffin. The best part, I put butter on half of one of them, and it actually detracted from the taste. 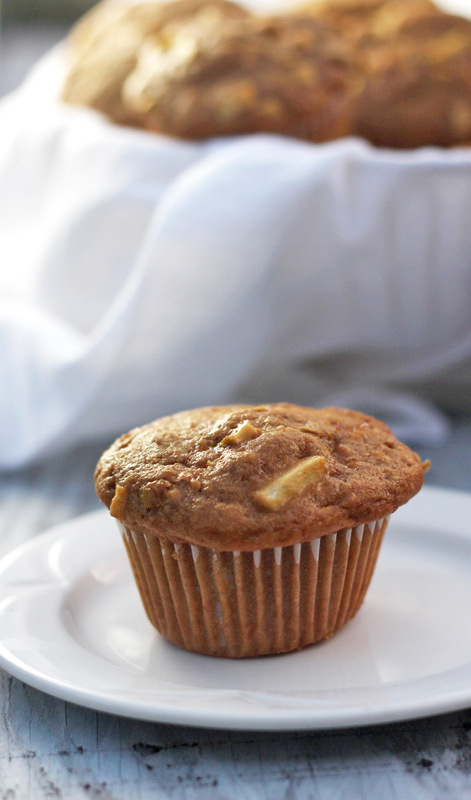 For me, that is the ultimate goal of muffin – for it to be delicious as is. If you have not used coconut sugar before, I highly recommend you try it, but if you don’t want to brown sugar substitutes well. I have not actually tried these with brown sugar myself, so if you try it, please let me know how it turns out. This probably makes me crazy or something, but one of the things I love about baking with apples is the way they look when you are chopping them – all nice and neat. I just couldn’t resist taking a picture of them. As you can see, I used Granny Smiths and didn’t peel them. Here they are still in the pan. I didn’t take any out. I just have this insanely large muffin pan that I used to use when I made cupcakes for the farmers’ market. It makes 24, but this recipe only makes twelve, so there was extra space. Fresh out of the pan. 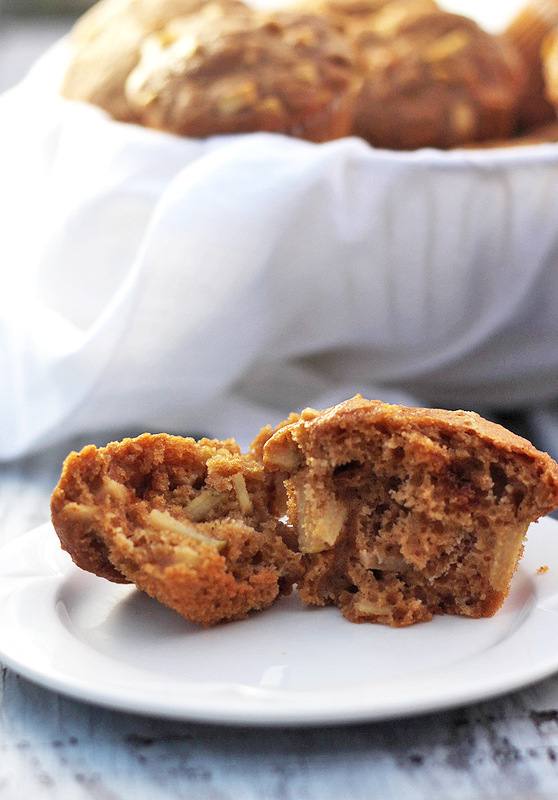 Moist, delicious, and full of apple on the inside. I think the olive oil is what makes them so moist. 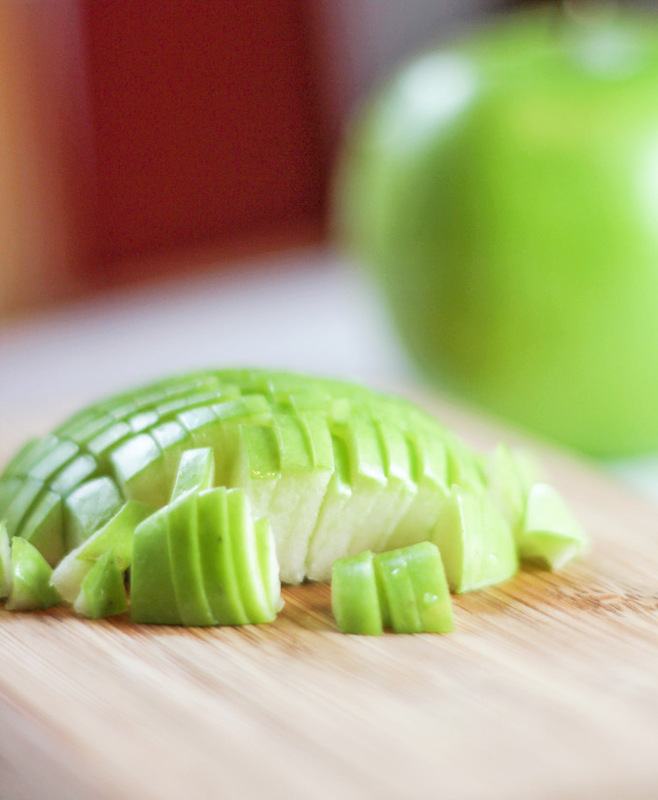 After you have chopped the apples, sprinkle with the lemon juice and stir to coat. This will prevent the apples from turning brown. Line 12 cavities of a muffin pan with liners. Whisk together flours, baking powder, baking soda, salt, cinnamon, and coconut sugar in a large mixing bowl. Stir together yogurt, oil, eggs, vanilla, and honey. Stir into dry ingredients just until all is moistened. Evenly divide mixture among 12 muffin cups. Bake for approximately 24 minutes or until a pick inserted in the center comes out clean. I am having my morning coffee as I’m reading this. How I wish I had one right now! 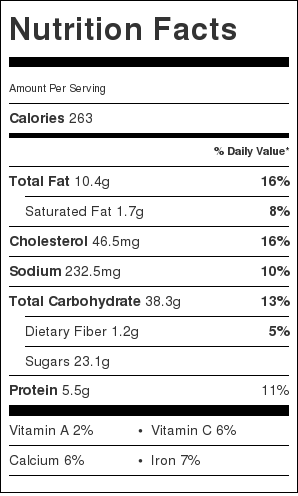 By the way, love having the nutritional information. Glad you like the nutritional information! I’ve only been putting it on the healthier posts. Not sure I even want to know about things like brownies. Hi, Robin. I know! I have been to your site too. I love the German recipes. My husband’s mother was German, so German food is a favorite around here!